​We’ve recently seen an increase in the number of people talking about neurodiversity and at long last this is beginning to get the attention it deserves. However, accompanying the increased awareness it would appear we are also seeing an increase in the number of people who are simply seeing this as a business opportunity which I believe is a less than helpful situation if they are not trained in this area of work...not least because if people are brave enough to speak out and seek support we should ensure the information and support they are provided with is appropriate and of the highest quality. As well as seeing this increase in people ‘getting on the band wagon’ as a business I believe there is also a degree of confusion over what the word actually means. The lack of clarity has prompted me to write this post because in this situation when seeking support services etc there is the risk of taking a provider ‘on face value’ and we may commission someone without really checking their credentials which may result in getting either incomplete or inaccurate information and guidance. ​So, firstly let’s look at what the word neurodiversity actually means and then look at the current use of the word. The word neurodiversity relates the diversity of human brains and minds – the infinite variation in neurocognitive functioning within our species. (Which when viewed in the wider context, actually relates to each and every one of us…because we are all individuals and therefore every brain is different). However, there are those individuals who have a brain that functions in ways that diverge from the dominant societal standards of ‘normal’ and these you may also see referred to as being Neurodivergent depending upon who has written the article. ‘Neurodiversity is a concept where neurological differences are to be recognized and respected as any other human variation. These differences can include those labelled with Dyspraxia, Dyslexia, Attention Deficit Hyperactivity Disorder, Dyscalculia, Autistic Spectrum, Tourette Syndrome, and others. (2011 US National Symposium on Neurodiversity). 'Neurodiversity' is a relatively new term that refers to people who have dyslexia, autism, ADHD, dyspraxia and other neurological conditions. (ACAS 2017). 'It describes 1 in 8 of the populatiion recognising the variety of ways we may learn and understand the world we live in and for some the challenges to do so'. (Professor Amanda Kirby, 2018). ​Whilst these statements have become acknowledged and accepted, often when we read articles about neurodiversity we see reference to only one or two of the neurodivergent ‘conditions’ which also adds to the confusion. (This is especially the case with regards to Autism which is rooted in to the work of Australian Sociologist Judie Singer who first referred to neurodiversity in the 1990s). In light of this, it is important to understand that neurodiversity-related posts and articles are commonly either written from the perspective of the author’s own areas of specialism or they are written by someone who gives their own personal perspective of what they feel neurodiversity is – both of which will not necessarily give a comprehensive and accurate overview of the subject. So, my advice, when reading posts about neurodiversity, is to check the authors background and their credentials and/or check the credentials of those they are quoting within the article. As with any subject area, ideally if you are searching for speakers or seeking specialist advice & training services there is an essential triune of ingredients to consider, as seen in the diagram below – however this is especially important in relation to neurodiversity as it is essential that what you ‘buy’ should if possible include all of the recognised neurodivergent ‘conditions’. The provider should be qualified in this area and current in their knowledge of the subject. The provider should have a proven track record in the provision of the service they are providing. The delivery of the service should be relevant and useful to the needs of the particular situation/environment. Ideally, your chosen neurodiversity related services should be a service provider who sits in this ‘sweet spot’ where all three areas overlap (indicated with a heart in the diagram). So, when buying-in to either post & articles or neurodiversity-related services check for authenticity, experience & quality. Right Resources Limited....for a thriving and productive neurodiverse workforce. Janette is an experienced consultant & coach specialising in dyslexia & neurodivergent conditions. She is the Staff Dyslexia &SpLD Consultant at Imperial College London and Senior Consultant to the BDA (British Dyslexia Association). She works with individuals and organisations across all sectors providing solutions-focused consultancy and support. She is also the founder of the Dyslexia Champions training & accreditation programme (a training programme which covers 7 neurodivergent 'conditions'). The Dyslexia / Neurodivergent-Friendly Workplace. 10 Things Every Employer Should Know About Dyslexia & 'Neurodivergent Conditions'. 1. It's widely accepted that most dyslexic/neurodivergent individuals have strengths/positive attributes which could significantly benefit their employing organisation. 3. When individuals know where to go to find out what support is available to them within the organisation they feel safe and they usually welcome the opportunity to have a conversation about it. 4. These neurodivergent ‘conditions’ are commonly accompanied by anxiety - and an unsupportive workplace culture commonly results in lack of disclosure if & when an individual starts to experience difficulties. 5. If there is a recognised, accessible process of support in place, seeking and accessing appropriate, tailored support can be a straightforward, positive experience which is relatively low cost. 6. Reluctance to disclose when these individuals are experiencing difficulties can impact on their wellbeing…and in the longer-term, if no support is accessed, this can have a negative impact on mental health. 7. Providing appropriate, professional, workplace-focused support to neurodivergent members of staff in a supportive environment is likely to enhance wellbeing and increase engagement. 8. HR departments may assume they understand how dyslexia & other neurodivergent conditions such as dyspraxia, dyscalculia, ADD… can impact within the workplace and they may believe they are meeting legal obligations but unless they have undertaken professional training with a recognised 'body' their policies may be inaccurate and their processes may not be appropriate. 9. Employees in ‘dyslexia/neurodivergent-friendly’ organisations are more likely to fulfil their potential and make valuable contributions. (It is important to remember that neurodivergent individuals have helped shape the world we live in and these include; Albert Einstein, Steve Jobs, Henry Ford...and many more). 10. It is estimated that dyslexic/neurodivergent individuals account for up to 18% of the population. If employing organisations are not providing appropriate support innumerable employees are likely to be ‘treading water’ (not making expected progress) at best… and if they don’t feel able to reach out when they need help there is an ‘unseen’ cost in terms risk to wellbeing and mental health as well as costs associated with reduced productivity, absenteeism etc. ​Being ‘dyslexia/neurodivergent-friendly’ makes good business sense. It’s good for people and good for the employing organisation. An increasing number of employers are now starting to see the benefit of having Accredited *Dyslexia Champions within their workforce. These impartial, knowledgeable volunteers have undertaken a course of study (*which includes 7 neurodivergent ‘conditions’ and other subject areas such as listening skills, wellbeing & mental health) equipping them to be able to answer questions and provide signposting which enables people to make informed decisions about whether to seek formal support …or not. This role has the potential to act as a catalyst for positive change and already some of these individuals are making significant contributions towards ensuring their employing organisations become more ‘dyslexia/neurodivergent-friendly’ organisations. Shouldn’t all organisations have Dyslexia Champions™? ​To find out more about the programme please click here. I’m dyslexic why would you employ me? Taking the right steps to career success. Are individuals with dyslexia and other neuro-divergent conditions aware of the many associated strengths they have and the career paths that will utilise and build upon these? Having the ability to write confidently about your unique strengths and skills in an application form or CV, or to remember to mention all of these during an interview isn’t easy and can be a challenge for anyone. Neuro-divergent individuals may find this process particularly challenging if they have difficulties with literacy, working memory, speech etc. This poses the question, what support is available for individuals experiencing these challenges and how can we help them to communicate their strengths most effectively during the recruitment process? It is well known that individuals with neuro-divergent conditions often have many associated strengths that are vital for the growth, productivity and success of businesses, which include; determination, strong atypical problem-solving skills, creativity, empathy and many more. We also know that these well sort-after and highly important set of skills can be overshadowed or held back by some of the underlying challenges faced by neuro-divergent individuals. However, those that seek support for their challenges and develop coping strategies for these, will see their strengths and skills flourish in addition to their self-esteem. Recognising your personal strengths and being able to communicate these effectively both in writing and verbally, is vital in helping you to get the job you’ve always wanted and to make the next step in your career! If you are dyslexic/neuro-divergent, a Career Coach that can help you develop effective coping strategies for any challenges you may face during the recruitment process and who can also help you to identify and effectively communicate your strengths, could help you find a job you’ll love but also further enhance your confidence and well-being. A new career path…will my dyslexia stop me from getting my dream job? Are the challenges associated with dyslexia stopping you from reaching your goals and building the career you’ve always dreamt of? Many of us dream about being in our ideal job or think about how great it would be to run our own business and be our own boss but what if the challenges associated with dyslexia are preventing us from doing this? Are these challenges affecting your confidence in taking the next step in your career? Case studies tell us that individuals with dyslexia or other neuro-divergent ‘conditions’ can experience a lack of confidence and low self-esteem if they haven’t received the right support. We also know that the associated strengths dyslexic individuals have such as creative thinking and excellent oral communication skills are less likely to shine if confidence is low. Applying for a new job, becoming self-employed or starting a business can be a daunting process for anyone but imagine how difficult this would be if your confidence is low and you’re not aware of your own personal strengths and skills? Recognising your abilities and being confident about them is crucial in helping you to move into a new job or career you love. To convince potential employers, clients and partners that you are the person they want to hire or work with, you will need to confidently describe your skill set and past experience. Many individuals require some coaching or guidance to help them to do this effectively and finding a coach with the ability to build your confidence, show you how to recognise your strengths and skills will help you to become a much stronger applicant for your dream job. 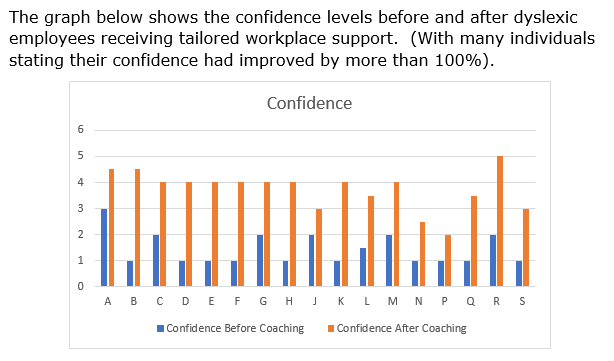 In addition, a coach that has an understanding of your challenges and who can recommend strategies to help you cope more effectively will further enhance your confidence and well-being. Specialist Career Coach & MBTI Practitioner. A new career path….but what about my dyslexia? What difficulties do dyslexic individuals have when changing career path and could they end up in a job that doesn’t utilise their strengths? Finding a new job that you love can be a huge challenge for anyone but imagine how difficult it is likely to be for someone who has challenges associated with dyslexia. There is a huge amount of advice and guidance about how to find your dream job on the internet but how much of this is dyslexia friendly and what related support and guidance has been tailored for a dyslexic audience? Research has found that dyslexic individuals have many associated strengths, which include; creativity, good problem solving ability, lateral thinking and many more but without tailored career support, there is a risk dyslexic individuals could find themselves in a job which doesn’t utilise these. When choosing a new career we often focus on what looks exciting and interesting about the new job or career pathway but we don’t always think about what the challenges could be. This is a trap that some dyslexic individuals may also fall into which could lead to them hating a job that they thought they would love! Whilst there are thousands of qualified Career Coaches, Careers Advisers and Recruitment Agencies that can help you create a new CV or make your interview technique slick there has, until now, been minimal tailored career support for dyslexic and other ‘neuro-divergent’ individuals. An understanding of the challenges dyslexic individuals face along with the knowledge of their highly sought after strengths in the workplace, can be hugely beneficial to those seeking careers guidance and support. To find out more about specialist career coaching for individuals with dyslexia and other ‘neuro-divergent’ individuals please click here.